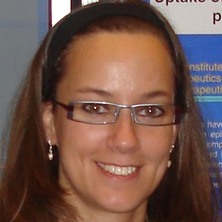 Dr Pavla Simerska has experience in the field of vaccine and drug design, development and delivery, peptide and carbohydrate chemistry and enzymatic glycosylation. She received her Master degree in Biochemistry and Biomedicine from the Institute of Chemical Technology in Prague, Czech Republic in 2002. She was awarded 3 Votoček Fellowships while working on enzymatic glycosylations at the Czech Academy of Science. Pavla defended her PhD in 2006 and since then, she has been working as a Postdoctoral Research Fellow with Prof Istvan Toth at the School of Chemistry and Microbial Biosciences, the University of Queensland. Pavla has been teaching the Medicinal Chemistry course CHEM3008 since 2008 and coordinating it since 2011 when she received the Research & Teaching Award. She has been successful in receiving funding from UQ, Australian Research Council, National Health and Medical Research Council and she was awarded the ARC Australian Postdoctoral Fellowship in 2010 and Deputy Vice Chancellor Fellowship in 2013. Dr Simerska was elected to be a Vice-President of the Australian Chapter of the Controlled Release Society and serves on the Early Career Researcher subcommittee, SCMB, UQ. Pavla has published over 40 peer-reviewed publications/proceedings. Biophysical characterization of lectin-glycan interactions for therapeutics, vaccines and targeted drug-delivery. Abdel-Aal, A. M., Batzloff, M. R., Faria, A., Fujita, Y., Good, M. F., Phillipps, K. S. M., Simerska, P., Toth, I. and Zaman, M. (2007). The importance of epitope and lipid orientation in the design of synthetic self-adjuvanting group A streptococcal (GAS) vaccine. In: Proceedings of the 4th international Peptide Symposium in conjunction with the 7th Australian Peptide Conference and the 2nd Asia-Pacific International Peptide Symposium, 2007. 4th international Peptide Symposium in conjunction with the 7th Australian Peptide Conference and the 2nd Asia-Pacific International Peptide Symposium, 2007, Cairns, Queensland, Australia, (). 21 - 25 October 2007. Abdel-Aal, A. M., Fujita, Y., Faria, A., Simerska, P., Batzloff, M. R., Good, M. F. and Toth, I. (2006). Development of totally synthetic self-adjuvanting vaccines against Group A streptococcus. In: Andrew Davey, Annual Conference of the Australasian Pharmaceutical Science Assn. Annual Conference of the Australasian Pharmaceutical Science n, Adelaide, Australia, (). 3-5 December 2006.